The single best street food that you can have in Italy is pizza al trancio i.e. a slice of pizza on the go. It doesn't get more typical and local than this. You find this in both bakeries and dedicated pizzeria al trancio. Some cities cut slices out of round pizzas, others out of rectangular ones. In both cases, you walk in the shop, pay a couple Euros, and leave with a steaming slice of pizza. 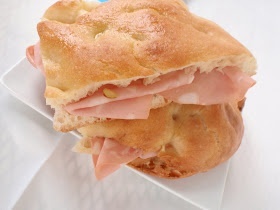 Second in our list is piadina which is a warm flatbread sandwhich-type concoction originating from the Romagna region. Fillings vary, although you'll typically get ham and cheese versions. 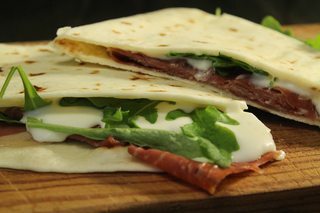 Why get a basic sandwhich when you can get a true Italian piadina? 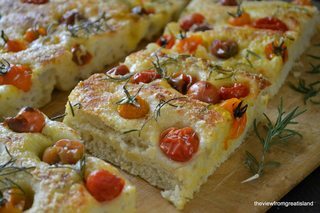 Third is focaccia, which is a simple bread-like product made with pizza dough and some other magic, depending on region and city. You can have them plain, with herbs, olives, tomatoes, or even filled with ham, cheese or whatever you find. Like in the case of pizza, both bakeries and dedicated shops sell them. 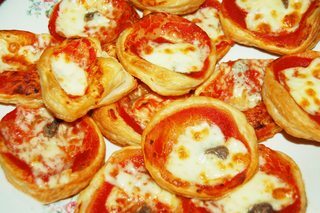 Where you find focaccia, you're likely to find pizzette (literally: small pizzas) too. Get a bunch of these and fight your hunger. 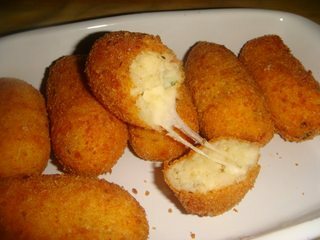 In pizzerie, and some bakeries, you'll find a variety of fried products such as arancini, supplì, crocchette, and olive all'ascolana (stuffed olives) (all pictured below in the order they appear). 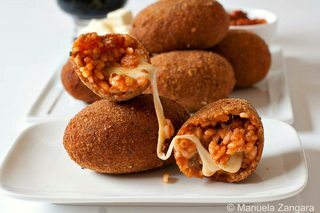 These first are a rice-based dish originating from Sicily, whereas the last are typical to Rome and other southern cities. Crocchette are mash-potato-based and are found mostly anywhere. 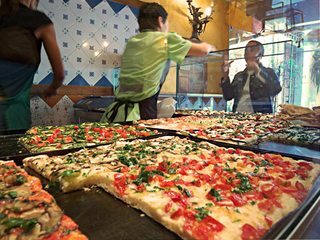 Typical in Rome is pizza bianca, which is something between bread, pizza and focaccia (see the image below). Most bakeries will have some. The best thing you can do is to walk into a place that sells both bread and sliced-meats and ask them to fill it up for you. Such a place is called a negozio di alimentari or drogheria in Italy. There you go, this is my secret to eating cheap when touring Rome: get pizza bianca and fill it up. 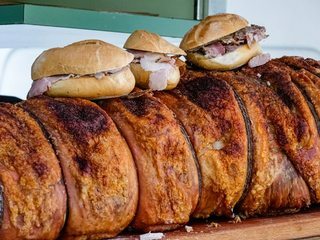 Also typical from Rome, although originating from Ariccia, is porchetta, a spit-roasted pig. Eat a porchetta sandwich and you'll never forget it. Fried-fish shops (friggitorie) are a somewhat recent trend, but their availability is increasing around the country. 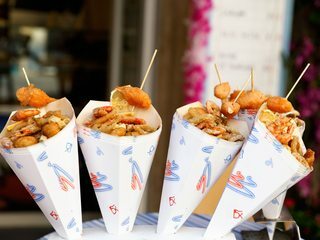 You'll typically get a takeaway cone of oil-proof paper filled with fried fish for a couple euros. Beware that those calamari are scolding hot! 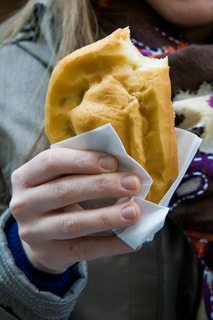 Panzerotti are another bakery product, which look very much like a small calzone, only fried. 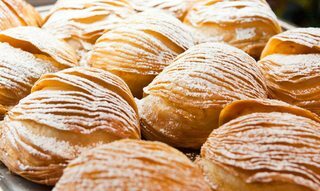 Although originating from Puglia, these can be found in many other regions in Italy. Indeed, Luini in Milan became famous with these. Pizza and gelato? It's as if I were compiling the most possibly stereotypical representation of Italy. Turns out though that these stereotypes are awesome! As you roam around Italian cities, you'll find them scattered with gelaterie i.e. ice-cream shops. No, none of that pre-made industrially-processed Algida garbage. 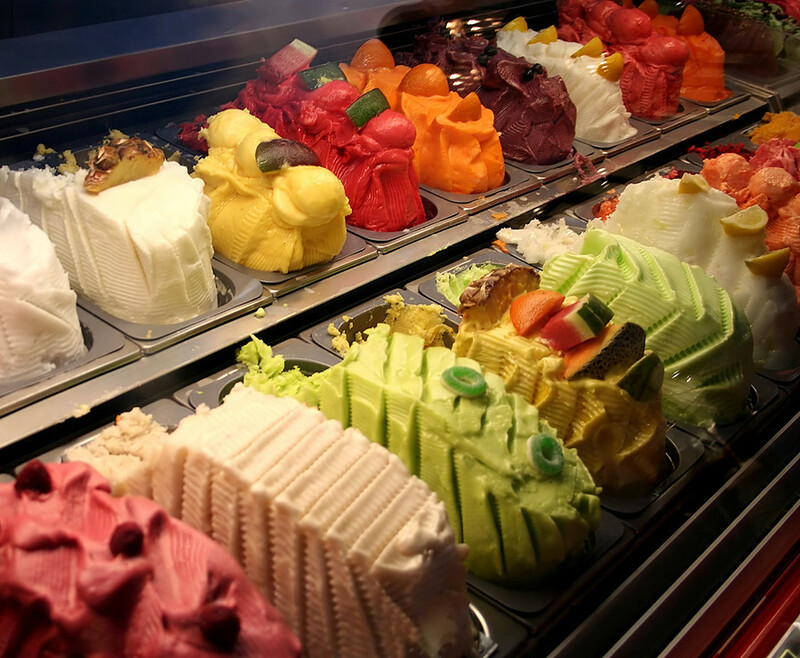 In Italy you'll find real hand-made ice cream in a million different flavours, shapes and decorations. Don't forget to ask for whipped cream on top. Every city has their own patisseries, most of which you can eat while walking. 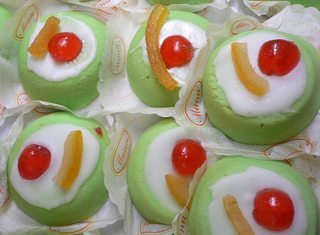 Look for a pasticceria i.e. a patisserie shop and ask for the typical desert. 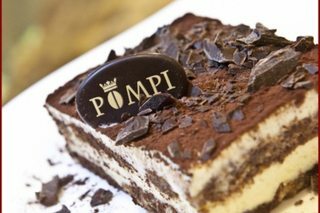 In Napoli that would be a sfogliatella, in Sicily maybe a small cassata or a cannolo, in Rome why not try Pompi's famous tiramisù (patisserie images are shown below in the order they appear)? 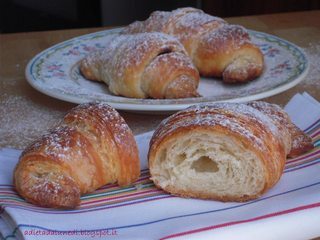 Other patisseries like cornetti (italian version of croissants) and bombe fritte can be found all around the country (patisserie images are shown below in the order they appear). 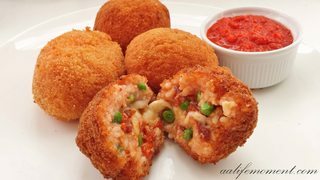 The accepted answer lists the popular foods available in almost all Italy but I think you can usually find some local (and sometimes strange) street food. 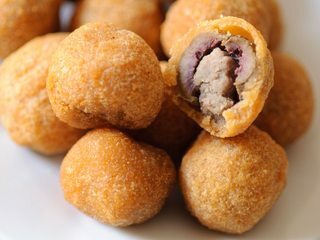 In Florence, for example, it's very popular lampredotto, in Tuscany it's not rare to find roventini (a sort of fried blood served with parmesan or chocolate). 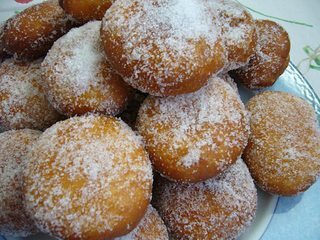 In Sicilia is famous meuza (spleen). These are some examples, if you visit Italy I suggest you to always give a try to local street food. Italy has no street food. the concept is just completely antithetical to the epistemology of food and culture in Italy. It would be sort of like saying that Mathematicians use slang in equations or Americans don't like drive-through banks. Italy has food that is fast, but it has no "fast food". Italy has food you can eat on the street, but it has no "street food". It has coffee, but no Starbucks. Not the answer you're looking for? Browse other questions tagged food-and-drink italy local-cuisine local-knowledge or ask your own question. What foods must I try while visiting Australia? “Safe” typical dishes to order away from the tourist trail in Thailand when English is not supported? How cheaply can we eat in Ireland while still experiencing traditional Irish foods?